We use a pastoral approach to working our eighty acre diversiﬁed family farm in northern Illinois, only 60 miles from Chicago. We strive to make sure that all our livestock have a forage-based diet to provide the energy necessary for good health. 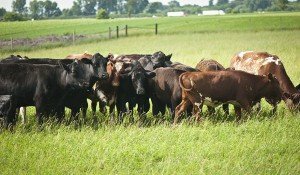 Our goal is to capture as much solar energy as possible via green grass and legumes, and then to let our pasture raised livestock harvest that energy through grazing. In addition, it is extremely important that we maintain a natural setting for our animals by providing them with open space to roam, mingle and graze. Here at Hasselmann Family Farm, we use no antibiotics, growth hormones or animal by-products in any of our feed rations. On our eighty-acre farm, we grow alfalfa hay and non-GMO grains like corn, wheat, barely, and oats, which we then feed to our chickens and pigs. Our cows, pigs and sheep our raised here on our farm from birth until slaughter which is done 45 miles from our farm at a U.S.D.A inspected processing plant. By raising and grinding our own feed and breeding our own animals we feel we can better control the quality and genetics of our livestock. We are proud to use sustainable farming practices, such as crop rotation, composting and pasture farrowing for our Berkshire sow herd. 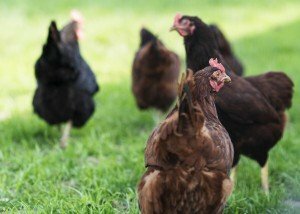 Our ﬂock of over 800 pasture raised Heritage breed laying hens roams freely over ten acres of lush green pasture from spring through fall. With the help of our friends at Miller Family Farm, Arthur, IL we also raise several thousand cornish cross broilers on pasture each year as well a small flock of turkeys for the holiday season. In late 2012, we also added a flock of sheep to the farm and we now have pasture raised lamb to offer our customers. Our family also has a small beef cow herd. Every year our Angus/Hereford/Shorthorn cross calves are born on lush spring pasture and grass-fed their entire lives – not just at the ﬁnishing stage. During the winter months, they are fed hay (dried grass) and minerals. The evidence of this successful farming model is in the superior taste and ﬂavor of our products. At Hasselmann Family Farm, we truly believe that Americaʼs small farms are one of its greatest assets and worth preserving. By providing safe and nutritious locally grown food, we hope to have a positive impact on our community and the environment. Every month or so, we send out a newsletter with farm news & product updates. Scott & Nena are also Independent Shaklee Distributors! A hen starts laying eggs at 19 weeks of age and the average number of eggs laid by a hen in the year 259.